And this story has circulated among the Jews to the present day.. I. THEME: Let proclaim the Good New “Christ is resurrected” to all people. Today readings center on Jesus’ resurrection. In the first reading, St. Peter and other apostles witnessed Jesus’ resurrection by practical facts and king David’s prophecy in Psalm 16. In the Gospel, God’s messenger witnessed for Jesus’ resurrection and Jesus himself appeared to the women. He commanded them to bring the news of his resurrection to the apostles. 1/ Reading I: God planned His plan of salvation through Christ’s death and resurrection. 1.1/ Christ is the Messiah: The main point which St. Peter must prove to the Jews was that the Messiah must go through sufferings and death to reach his glory. The Jews are expecting a powerful Messiah, they can’t accept a Suffering Messiah. Peter proved this point first, by the practical facts which had happened, and then, by the words of the Scripture. 1.2/ King David prophecied about Christ’s death and resurrection: According to Peter, Christ’s resurrection fulfilled King David’s prophecy. The important verse is verse 10 of Psalm 16 which stated, “you will not abandon me to Sheol, nor let your faithful servant see the pit.” The scholars put out two questions. First, is this verse applied to King David or Christ? Secondly, is God’s liberation meant from the eternal death and giving back the divine relationship or from the corruption after death? The word “shahat” can be translated as decay or corruption as the LXX version, or simply as the pit as the NAB version. 2/ Gospel: Christ is really resurrected from the death. 2.1/ Jesus commanded the women to bring the resurrection news to the apostles. (1) The angel announced the resurrection: The women who accompanied Jesus in his Passion went to the tomb early in the morning to anoint his body; they didn’t do so at his burial because of the Sabbath. When they reached the tomb, they witnessed things beyond their imagination: The tombstone which the high priest sealed, opened up before the soldiers’ surprise and shaking because an angel of the Lord descended from heaven, approached, rolled back the stone, and sat upon it. Then the angel said to the women in reply, "Do not be afraid! I know that you are seeking Jesus the crucified. He is not here, for he has been raised just as he said. Come and see the place where he lay. Then go quickly and tell his disciples, 'He has been raised from the dead, and he is going before you to Galilee; there you will see him.' Behold, I have told you." (cf. Mt 28:1-7). 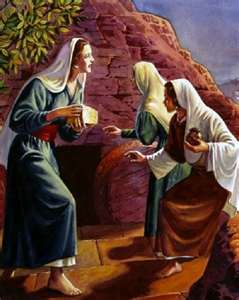 The women hastily left the tomb, though were afraid but joyful, ran back and announced the Good News to Jesus’ apostles. (2) Jesus appeared to the women: On the way back, Jesus suddenly appeared to them and greeted them. The women approached, embraced his feet, and did him homage.Then Jesus said to them, "Do not be afraid. Go tell my brothers to go to Galilee, and there they will see me." Loving Jesus means not to keep him for ourselves, but to announce his Good News so that everyone shall also believe in him. This important point shall be repeated many times in the coming days. Everyone need to hear about Jesus’ resurrection so that they shall know their life shall not be ended with their death, but be extended to the eternal life with God. (1) Before the resurrection: The Jewish leaders came to see Pilate and ask him to have soldiers to carefully watch out at the tomb, since Jesus had announced he shall be resurrected three days after his death. They feared that Jesus’ disciples might steal his body and announce his resurrection; and then, the falsity shall be more grave than before. Pilate told them, “The guard is yours; go secure it as best you can." So they went and secured the tomb by fixing a seal to the stone and setting the guard” (cf Mt 27:62-66). (2) After the resurrection: While the women were going back, some of the guard went into the city and told the chief priests all that had happened.They assembled with the elders and took counsel; then they gave a large sum of money to the soldiers,telling them, "You are to say, 'His disciples came by night and stole him while we were asleep. 'And if this gets to the ears of the governor, we will satisfy (him) and keep you out of trouble. "The soldiers took the money and did as they were instructed. And this story has circulated among the Jews to the present (day). When people did wrong thing, they shall continue to do more wrong things, this wrong shall lead to other wrong thing. The Jews found the wrong accusation “blasphemy” to condemn Jesus; next they found another one “Jesus called himself a king” to asked Pilate for the death sentence because Jesus was against Caesar; and now they used money to cover up their soldiers’ mouth. This shows that it wasn’t about their knowing of the truth, but their insistence to stay in the falsity due to their jealousy and material gain that they were enjoying. - “Jesus is resurrected.” We must believe this truth and proclaim to all people this Good News. We must also live according to this truth and witness for all people to know that there exists a life after death. - As the wicked plan to cover up the truth of the high priest in today gospel, the devil and the world are still finding all possible ways to cover up this truth by material gain and enjoyment.